(Dec. 10, 2014) -- UTSA Air Force Reserve Officer Training Corps (ROTC) Detachment 842 has received the 2014 Right of Line Best Large Detachment award. The group also received the prestigious national award in 2009. As the seventh largest unit across the country, the award is based on the number of second lieutenants inducted into the Air Force and other criteria including recruiting and retention, educational excellence and cadet activities. "There are 146 AFROTC detachments, all with excellent programs, so this is truly an honor," said Air Force Lt. Col. Lisa Thiem, commander of the UTSA detachment and department chair and professor of aerospace studies. "The award notification from headquarters stated that the students in our detachment positively impact AFROTC with numerous accomplishments and world-class service. Our students provide critical skills and knowledge to the world's greatest Air Force." 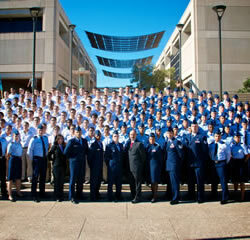 Originally part of a unit at Texas State University, Detachment 842 was established at UTSA in the 1980s. The detachment maintains an active recruiting program across Central and South Texas with a goal to recruit top-notch students to UTSA with the potential to be the future leaders of the Air Force. Special attention is paid to students' academic skills, leadership acumen and physical fitness. The average high school scholarship winner has a 3.6 GPA, 1140 SAT and a physical fitness report of 94 out of 100 points. The UTSA detachment commissions 20-30 second lieutenants each year into the Air Force in career fields ranging from pilot to cyber officer to nurse. Learn more at the UTSA Air Force ROTC Detachment 842 website.